This month has managed to feel both long and short at the same time, which really shouldn't be possible. For the most part I've started off my 2013 resolutions pretty well, with the exception of weight loss – that's at a standstill at the moment, but I've tackled some other things worth being proud of like…. In addition to writing a short story, I've been plotting for Dreamsters. I'm not sure if it will be the book I aim to actually complete this year, but it's the one demanding the most attention at the moment (which I guess makes sense since I started it around this time last year). In February, I plan to participate in author Jeannine Garsee's GRAPEMO (which is like NanoWrimo, but cooler). My personal goal is to add 5K to Dreamsters. Even though I can change that goal as the month progresses, I really hope they remain chatty enough to actually complete or surpass 5K in February. I came somewhat close this month, so I really hope I've set a reasonable goal. Wish me luck! Somehow I ended up reading a heck of a lot more this month than I set out to, but I'm not complaining. Getting a good jump start on my TBR pile for the year is A-OKAY with me. 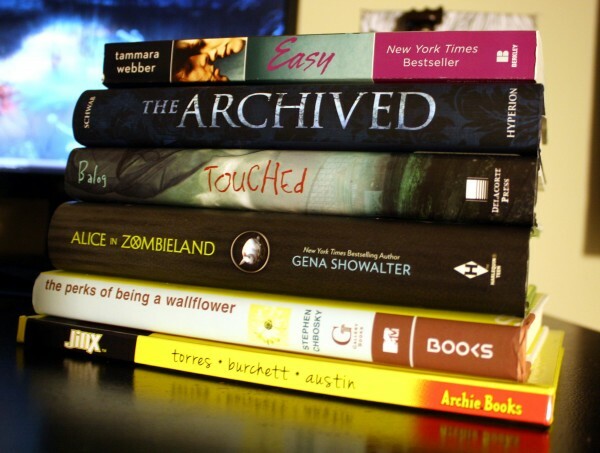 Most of the titles below the picture are links to the reviews I wrote for them on GoodReads. I did my first little mini shoot with myself to test out my new lights finally. You can read about that HERE. Outside of that, I only photographed Gideon once this month, but boy did it yield some cute pictures. So cute that Sock Dreams posted this photo on their social networking sites because he's wearing their socks! On this day, probably the biggest highlight of my month occurred. Gideon's been addicted to phones for as long as he could get his grubby hands on them. He has several of his own "play" phones, but still fights to play with real ones. While shooting him in the socks, he started playing with the house phone – making it ring, playing the saved messages, etc… when suddenly he said, "HELLO!" It sounded a little more like "herro" but it was obvious what he was trying to say. It's the first full word I've heard him say and it totally made my day. I'm not sure if this link will work, but we got him to say it a few more times and recorded him. Click HERE if you want to hear it. Usually this would be the point where I'd review my favorite music of the month, but to not make this post as terribly long as it's been in the past, I've decided to make the music part of my monthly review it's own thing on the last Friday of the month called, "Music Friday" which is sort of a 'Best Of' of the weekly Music Friday posts I make on tumblr and FB all month. If you were reading this for the music and missed last Friday's post click HERE! Overall, January was pretty decent for me. How about you? 6 Responses to "January: In Review"
And wow, you started your short story two years ago? I knew it was a while since you first worked on it, but I hadn’t realized it was that long! I’m so glad you were finally able to wrap it up, since–as you’ve already seen from my email–I loved it to bits! Can’t wait to see you post it! Also, I’m so excited that you’ll be doing Grapemo with me this year. I agree: it is much cooler than NaNoWriMo! Good luck writing at least 5K for Dreamsters for it! And whoa, so many books–many of which are thick, to boot! Show that TBR pile who’s boss! As for my January accomplishments, I completed 24 pieces of art, as well as read heaps. (I hope to have a post on the latter up in a few days.) Here’s hoping the both of us can be uber-successful in February, especially since we both plan to do Grapemo! I’m honestly surprised I accomplished as much as I did considering I was pretty depressed for the better part of January. Usually that stops progress completely. It’s hard to believe that short story is from two years ago. It’s even harder to believe how many I still have unfinished from two years ago too. But two years ago my writing took a big punch to the gut so… at least I’m “recovering” now. I’m glad to hear you could see the link of Gideon (wasn’t sure it’d work). I swear, I’m the proudest aunt ever sometimes. He totally makes my day whenever I get to see him just by being himself. You had a MAJORLY successful month in January and it makes me a proud friend. I’m so excited for what February will bring you! And I hope we both accomplish our goals for GRAPEMO! It’s going to be fun though, even if we come a little short. I totally want those SOCKS! Sock Dreams is my favorite place to shop for fun socks, stockings, and arm warmers. You should check them out. Their customer service is unlike any out there. They’ll draw cool pictures on your invoice at your request, send you awesome stickers of their logo, and offer free shipping on anything. And if you ever have an issue, they handle it immediately without question and at no expense to you. And they’re nice while they do it.